A mysterious spiral of light has appeared in northern Norway one day before President Obama arrives to give his Nobel Peace Prize acceptance speech in Oslo. The spiral has baffled experts who do not believe it is related to the Aurora Borealis. Speculation that it is a rocket launched by the Russian Northern Fleet has been denied by Russian authorities. Similarly the Norwegian military has claimed no knowledge of any rocket launches in the area. There has been speculation that it may be some exotic weapon system, the opening of a space-time portal, or even UFO activity. Obama’s arrival in Norway on December 10 to give his acceptance speech only adds to the mysterious appearance of the lights. Is it a pure coincidence or is it in some way related to Obama’s upcoming speech? The object appeared on the morning of December 9 and has been photographed and filmed by thousands of Norwegians over a wide area ranging from Finnmark in the country’s north to Trondelang in the south. It is a giant spiral of green-blue light that appears directed towards a mountain. 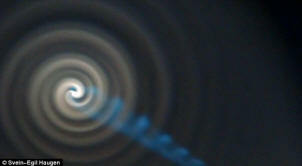 According to observers, a giant light spiral appeared and within seconds covered the entire sky. A green-blue beam of light then shot out from its center. Here is how Totto Eriksen, from Tromso, in northern Norway described it. I was driving my daughter to school when this light spun and exploded in the sky. We saw it from the Inner Harbour in Tromso. It looked like a rocket that spun around and around - and then went diagonally across the heavens. It looked like the moon was coming over the mountain - but then turned into something totally different. People just stopped and stared on the pier - it was like something from a Hollywood movie. The entire event lasted between two-three minutes before disappearing. 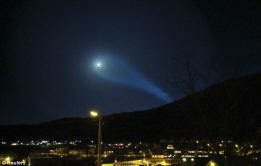 Norway’s leading meteorologists are baffled, with most concluding it is some kind of rocket launch that went awry. 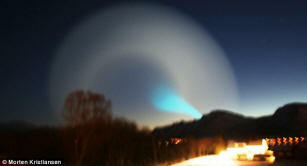 This was seen over an exceptionally large area of the country - in all of north Norway and the Trondelag. My first thought was that it was a fireball meteor - but it lasted far too long. It may have been a missile from Russia - but I can't guarantee that is the answer. I rang the Air Traffic Control tower in Tromse. They said it was over in two minutes. To me, that is far too long for this to be an astronomical phenomenon. This spiral shape is unique. It is definitely not a variation of the aurora borealis - northern lights. Obama’s December 10 Nobel Prize acceptance speech is expected to focus on international cooperation on the removal of nuclear weapons and promoting diplomatic solutions to global problems. Coming nine days after Obama’s announcement of a 30,000 troop surge for Afghanistan, it is expected that he will show his commitment to international diplomacy and cooperation. He may use the opportunity to launch a bold international initiative to achieve this end. The appearance of the enormous light spiral in northern Norway may be a sheer coincidence and unrelated to his upcoming speech in Oslo. Alternatively, the mysterious spiral of light may be a sign from an unknown intelligence that Obama’s acceptance speech may be a catalyst for major global changes that lie ahead. With much speculation that the Obama administration is poised to make some kind of announcement concerning extraterrestrial life soon, the light may be sign for him to boldly go where no U.S. President has gone before. Missile Failure Caused by UFO/ET Intervention? After first denying any missile test in the White Sea region where mysterious spiral lights could be seen over much of Norway on December 9, Russia one day later announced an embarrassing failure of a new intercontinental ballistic nuclear missile. Russia’s Bulava missile spun out of control during the third stage of a test launch. 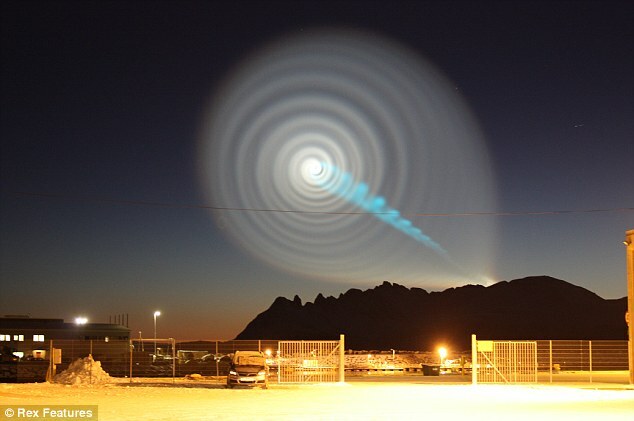 While Russia did not claim the spiral light was caused by the missile, the announcement nevertheless led to claims that the mystery has been solved. Most analysts confidently proclaimed that the light spiral was caused by the failed rocket launch. The fact that it occurred one day before President Obama’s Nobel Peace Prize acceptance speech where he discussed the abolition of nuclear weapons is viewed as sheer coincidence. However, was the failed missile launch a mere coincidence? There have been a number of occasions where nuclear missile tests have failed due to UFO intervention. Did an extraterrestrial intelligence cause the failure of the Russian rocket in order to generate a spiral of light knowing that it would capture world wide attention during President Obama’s Norway trip? Did extraterrestrials do so knowing full well that Obama would discuss the abolition of nuclear weapons during his Nobel Peace Prize acceptance speech? On December 10, the Russian Defense Ministry announced a failed launch of its Bulava intercontinental missile by the Dmitry Donskoi nuclear submarine. “It has been established... that the missile's first two stages worked as normal, but there was a technical malfunction at the next, third, stage of the trajectory." This is how Phil Plait, creator of the Bad Astronomy website, described how an out of control rocket could have caused the spiral lights. That’s exactly what I would expect if whatever is being ejected by the rocket ran out; the arms of the spiral would expand away from the center, leaving black emptiness in the middle. So that’s my hypothesis. A rocket got out of control, perhaps losing a stabilizer, and started to spiral. The two spirals, different in shape, size, and color, indicate something happened in the middle of all this (the rocket second stage fired while still spinning, or something else started leaking out), changing the rocket’s direction. Then, when the fuel or whatever ran out, the white spiral began to disappear from the inside out as the material expanded in space. Here’s a video simulation that graphically describes what apparently happened during the failed rocket launch. With the Russian announcement and greater detailed study of the light spiral, many articles have emerged ridiculing theories proposing an extraterrestrial factor. It has been simply assumed that the failure was due to the poor track record of the Bulava missile which after all had failed six out of 12 previous tests. Such dismissals of extraterrestrial involvement, however, do not explore an alternative explanation. Did an extraterrestrial intelligence deliberately cause the Russian nuclear missile failure in order to create the resulting light spiral knowing the global impact it would have on the day of Obama’s Nobel Peace Prize acceptance speech? Furthermore did extraterrestrials do so in order to highlight and even endorse the nuclear disarmament that was a critical component of Obama’s acceptance speech? One urgent example is the effort to prevent the spread of nuclear weapons, and to seek a world without them. In the middle of the last century, nations agreed to be bound by a treaty whose bargain is clear: All will have access to peaceful nuclear power; those without nuclear weapons will forsake them; and those with nuclear weapons will work towards disarmament. Those who seek peace cannot stand idly by as nations arm themselves for nuclear war. There have been a number of occasions where UFOs have deliberately interfered with nuclear missile launches to cause their failure. One incident occurred at Big Sur California in 1964. Professor Robert Jacobs then served as a Lieutenant with the U.S. Air Force and was stationed at Vandenberg Air Force base. He was responsible for filming the test of an Atlas missile. [W]e were testing ballistic missiles that were to deliver nuclear weapons on target... my duty [was] to supervise the instrumentation photography of every missile that went down in that western test range... and into the frame came something else. It flew into the frame and shot a beam of light at the warhead. Now remember, all this stuff is flying at several thousand miles an hour. So this thing [UFO] fires a beam of light at the warhead, hits it and then it [the UFO] moves to the other side and fires another beam of light, then moves again and fires another beam of light, then goes down and fires another beam of light, and then flies out the way it came in. And the warhead tumbles out of space. Jacobs testimony has been confirmed by another Air Force officer who was present at the debriefing where Jacobs was commanded to silence. Other military whistleblowers have emerged to describe a number of UFO/extraterrestrial interventions that have caused nuclear missile failures during flight. Colonel Ross Dedrickson (ret.) served with the US Air Force and Atomic Energy Commission. After retiring from the Air Force I joined the Boeing company and was responsible for accounting for all of the nuclear fleet of Minuteman missiles. In this incident they actually photographed the UFO following the missile as it climbed into space and, shining a beam on it, neutralized the missile. I also learned of a number of incidents which happened, a couple of nuclear weapons sent into space were destroyed by the extraterrestrials…. the idea of any explosion in space by any Earth government was not acceptable to the extraterrestrials, and that has been demonstrated over and over. Other military witnesses have emerged explaining how nuclear missile facilities have been interfered with by UFOs, and this has been covered up on national security grounds. In conclusion, Russia’s admission that a nuclear missile test has failed at the same time as the mysterious light spiral appeared over Norway has satisfied most analysts over what happened. The link to extraterrestrials and to Obama’s speech has been consequently dismissed out of hand, and even ridiculed. However, most analysts are simply not aware of prior occasions where nuclear missiles have failed due to UFO/extraterrestrial intervention. Nor has any consideration been given to a possible link to Obama’s speech where he explicitly called for nuclear disarmament. 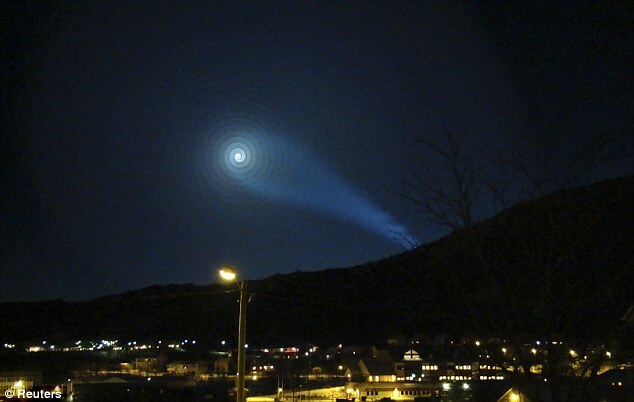 Given the past history of extraterrestrial intervention, it is very possible that the mysterious light spiral over Norway was deliberately caused by extraterrestrials that interfered with Russia’s testing of its newest nuclear missile.